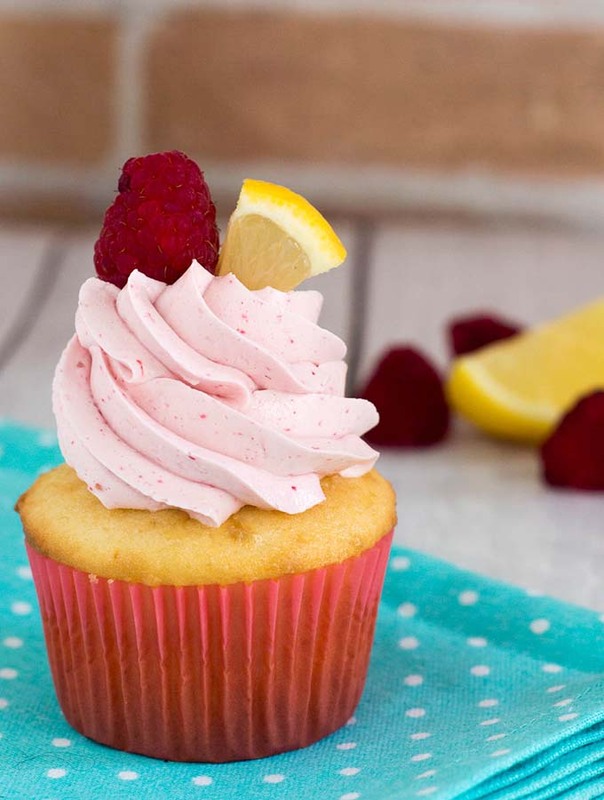 Raspberry lemon cupcakes are a delicious summer dessert. 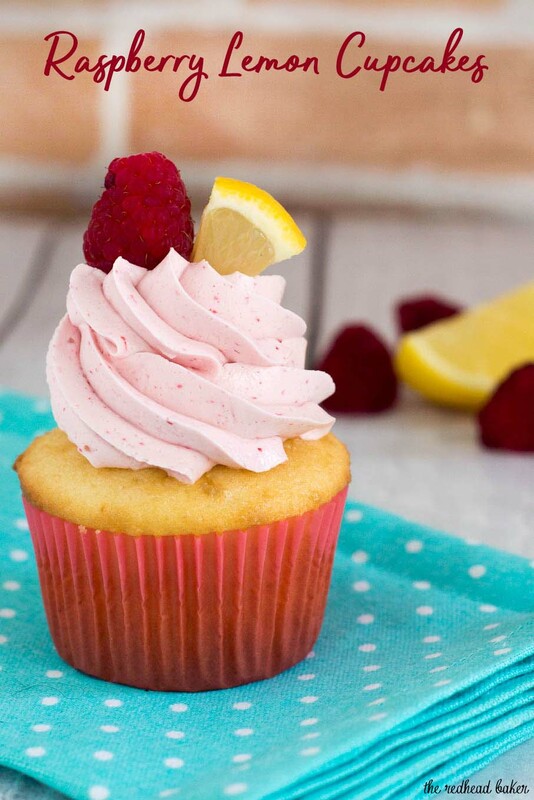 These fluffy cupcakes are filled with tart lemon curd and topped with silky buttercream flavored with raspberry puree. I can’t do a whole Farmers Market Week blog event and not include a dessert post. 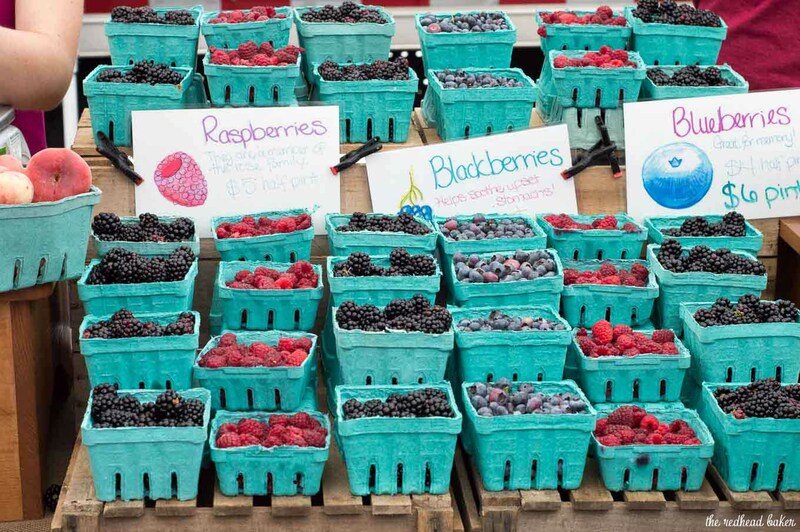 Summer berries are the best, and they can be used in so many delicious ways, from mousse to frozen pops to pie. 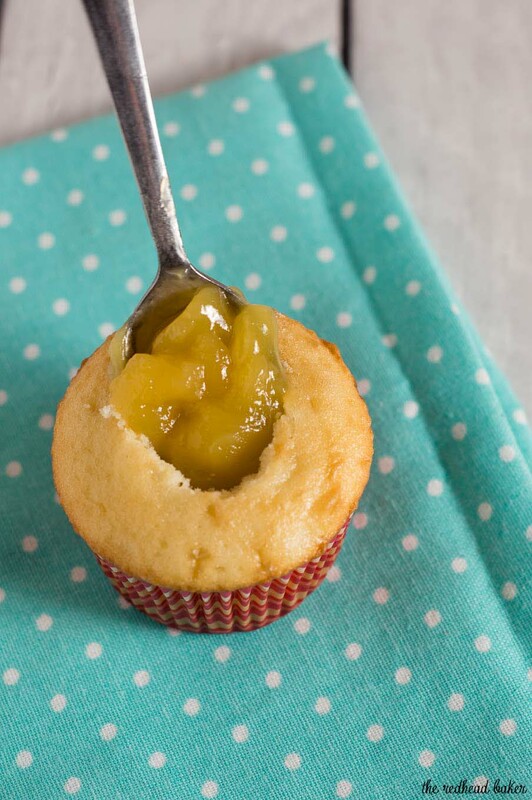 I’m not even sure I’ve shared a fruit-flavored cupcake here on the blog yet. 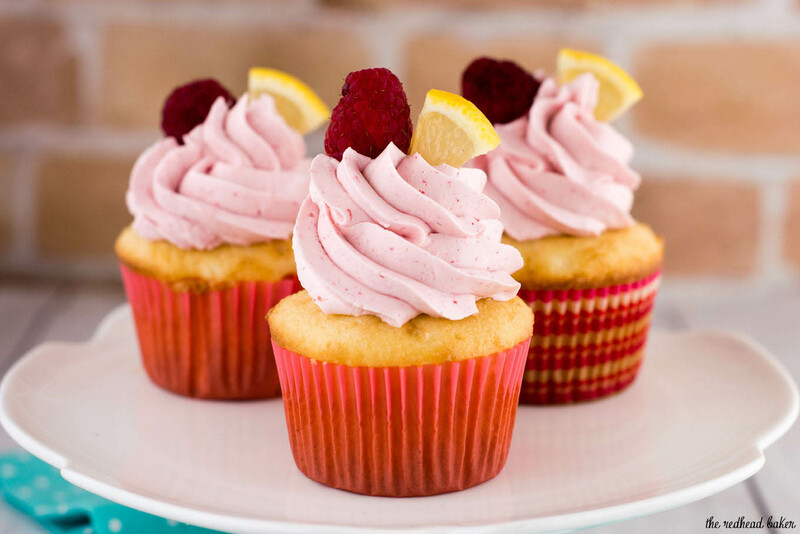 These fluffy vanilla cupcakes are filled with lemon curd and topped with my favorite buttercream flavored with raspberry puree. These fluffy cupcakes are the perfect balance of flavor and texture. I chose the recipe after reading a comparison of yellow cake recipes on Cookie Madness. The buttercream, oh the buttercream. Forget the cupcake, I could eat it straight from the bowl. It has silky texture, it’s not too sweet, and not too buttery. 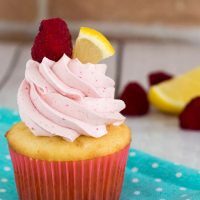 If making cupcakes plus buttercream plus raspberry puree PLUS lemon curd is too much, you could (A) make the curd and puree on Day 1, make the cupcakes and buttercream on Day 2; or (B) buy the curd instead (you’ll need about 1 1/2 cups to fill all of the cupcakes), or (C) add the zest of 1 lemon to the cupcake batter (cream it in with the butter, oil and remaining buttermilk) and skip the curd altogether, though it does add extra moisture to the cupcakes. I highly recommend frosting the cupcakes the same day you make the buttercream, if only because it’s a pain to warm the buttercream and re-whip it before using it. You can use a plain or star tip to pipe the frosting; it’s really just personal preference. I used an Ateco #32 open star tip. Frosted and filled cupcakes should be stored in the refrigerator. Let them stand at room temperature for 30 minutes before serving, to soften up the buttercream. Add a fresh raspberry and a small lemon wedge for garnish. Preheat the oven to 350 degrees. Line two 12-cup muffin tins with paper liners. Set aside. In a large measuring cup, whisk together the eggs, egg yolks, 3 tablespoons of the buttermilk and vanilla. Whisk together the flour, sugar, baking powder and salt in the bowl of your standing mixer. Using the paddle attachment, beat in the butter, oil, and remaining buttermilk on low speed until the dry ingredients are moistened, then crank it up to medium speed and beat for 1 1/2 minutes. Scrape down the bowl. Add one third of the egg mixture, and beat for about 20 seconds, and scrape the bowl again. Repeat two more times until all the egg mixture is incorporated and the batter is smooth. In a cold bowl with cold beaters, whip the cream to just beyond soft peaks. Stir a quarter of the whipped cream into the batter to lighten it, then carefully fold in the remaining cream. Portion the batter into the prepared pans, filling each well about 2/3 full. Bake until the center of each cupcake springs back when touched and a toothpick comes out clean but moist, about 17-20 minutes. Do not overbake. Cool the cupcakes in the tins on a wire rack for 10 minutes before removing them from the pans to a wire rack to cool completely before filling and frosting. Place the raspberries and sugar in a blender. Puree until smooth. Pour the puree through a fine-mesh sieve set over a mixing bowl. Use a spatula to force the liquid through the sieve until all that remains is the raspberry seeds. Remember to scrape any juices clinging to the underside of the sieve into the bowl. Discard the solids in the sieve. In a mixing bowl, beat the butter until smooth and creamy and set aside in a cool place. Have ready a heatproof glass measure near the stovetop. In a small heavy saucepan, heat 3/4 cup of the sugar and the water, stirring constantly until the sugar dissolves and the mixture is bubbling. Stop stirring and reduce the heat to low. In another mixing bowl, beat the egg whites until foamy, add the cream of tartar, and beat until soft peaks form. Gradually beat in the remaining 1/4 cup sugar until stiff peaks form. Increase the heat under the saucepan and boil the syrup until a thermometer registers 248 to 250 degrees. Immediately transfer the syrup to the glass measure to stop the cooking. If using a hand-held mixer, beat the syrup into the whites in a steady stream. Don't allow the syrup to foll on the beaters or they will spin it onto the sides of the bowl. If using a stand mixer, pour a small amount of syrup over the whites with the mixer off. Immediately beat at high speed for 5 seconds. Stop the mixture and add a larger amount of the syrup. Beat on high for 5 seconds. Continue with the remaining syrup, using a rubber scraper to remove any syrup clinging to the glass measure. Lower the speed to medium and continue beating for up to 2 minutes, or until the mixture cools. If, after 2 minutes, the mixture is not completely cool, continue beating on low speed until cool. Beat in the butter at medium speed 1 tablespoonful at a time. At first the mixture will seem thinner, but will thicken by the time all the butter is added. If at any time the mixture looks slightly curdled, increase the speed slightly and beat until smooth before continuing to add more butter. Lower the speed slightly and drizzle in the liqueur and the raspberry puree. 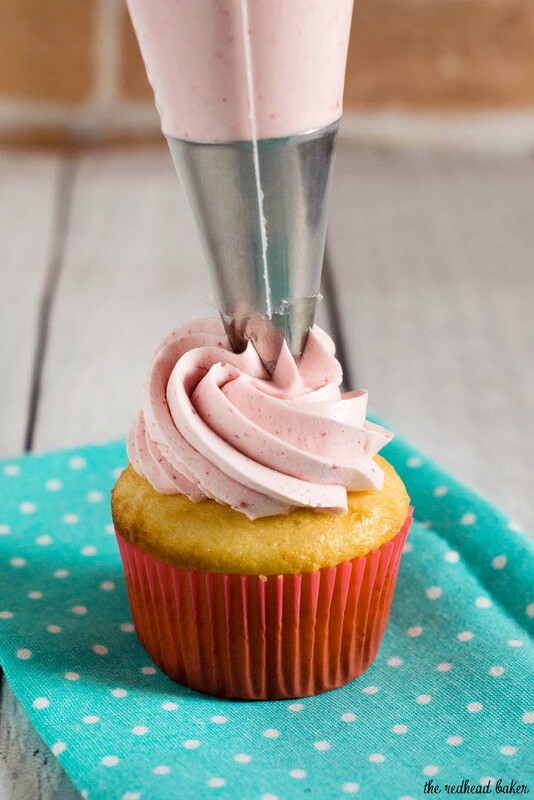 Use a paring knife to cut a small hole in each cupcake, ensuring you don't cut all the way through to the bottom of the cupcake. Spoon some of the lemon curd into each hole. Fit a piping tip into a pastry bag. Fill halfway with the raspberry buttercream and pipe a swirl of icing onto each cupcake. Such pretty cupcakes! Love the lemon-raspberry combo. Hi Valerie, you can use the same amount of frozen raspberries, just make sure they are not raspberries frozen in syrup. Thaw them before blending with the sugar.